Presenting pals Nicki Chapman and Jules Hudson escape to the country to find antiques with Natasha Raskin and Philip Serrell. Browse content similar to Nicki Chapman and Jules Hudson. Check below for episodes and series from the same categories and more! -We've had some fun, haven't we? -Their mission - to scour Britain for antiques. I'll do that in slow-mo. -But it's no easy ride. Who will find a hidden gem? -Will anybody follow expert advice? -I'm trying to spend money here. Put your pedal to the metal. 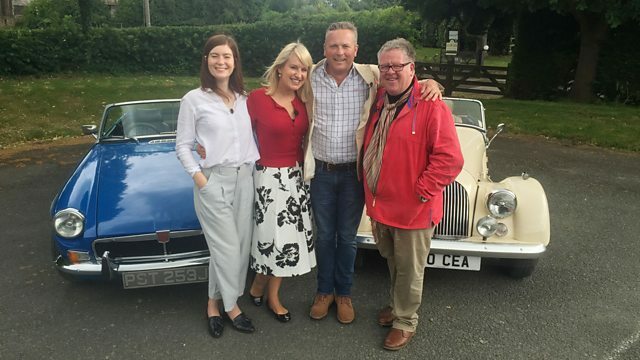 This is the Celebrity Antiques Road Trip. Jules Hudson and Nicki Chapman. You know what's interesting, Nicki, I mean, we do work together. -I think we've worked together for 10 years. -I don't even know you. -But we've never competed, have we? We've never competed in anything. -We work together but we very rarely meet. -I know it's bizarre, isn't it? But we know each other intimately. the hugely popular series Escape To The Country. as the word's biggest girl band, the Spice Girls. as a judge on music talent shows Popstars and Pop Idol. including antipodean extravaganza Wanted Down Under. The haggling - that's what I'm going to be looking forward to. I think your wily smile will do a better job at negotiating than me. -Yeah, I reckon, I reckon. Have I got a twinkle in my eye? "Oh, my goodness me, it's Madame Chapman!" -See, I'm a bit of an old fogey. I was a young fogey years ago and now I'm an old fogey. -But I've always been a fogey and I was called Granddad at school. somebody gave me The Young Fogey Handbook. Somebody wrote that and I still have a copy of it. around Herefordshire in this iconic cream Morgan 4/4. -This is your neck of the woods, isn't it? for the last four and a half years or so. Unspoilt, I think, this part of the country. It's very depopulated, that's the nice thing about it. Is that why you moved here, cos you don't have any friends? and the self-confessed grump Philip Serrell. I'm thrilled to see you, Phil. How are you? It's always a joy to see you. It's always a joy. -I find that happy, smiley face so infectious. -I think I might smile today. -I think you've cracked one out already. -It's a bit early for that! in this brilliant blue 1976 MGB. What about Nicki and Jules? Is it going to be boys v girls? Yeah, let's do that, actually. We don't do that enough. Boys v girls. I'd like to do that. of all these Popstars and Pop Idol shows when I was a kid. Once paired up, our teams will hit the road with £400 in their pockets. before finally finishing in North Finchley in London for auction. -Hello! Oh, they look cool! Look at this. Are you OK getting out? Perfect. A ladylike way of getting out. Hello. Lovely to meet you, Natasha. -I'm very well, thank you. -Are you unfolding yourself, mate? -If YOU'VE got that trouble, Lord knows what I've got. -It's a little bit tight, isn't it? -Nice to see you too. -Yes, we can do this, we can do it, Nicki! Teamed up, it's time to hit the road. -Which is the way in here? -Sorry, lads. Ooh! See ya! -So, is Jules always that competitive? -Yeah. He's already got a strategy. Yeah, he's already got a strategy. He didn't give too much away. -This car is intimate, isn't it? in Herefordshire to kick-start their hunt for antiques. -Have you bought at antique shops before or is it a pastime? -It's not a pastime, but I have done it and it went well. When you say it went well, does that mean your haggling went well? Haggling was good. I do like to haggle. Well, that's handy. First shop of this trip looks big. are the treasures of around 20 dealers. There's plenty to pick from. -Richard, nice to meet you. -So, this is, for Nicki and I, our first shop. -So, we'd better get started. -Shall we start at the top and work our way down? -We're going to have to be disciplined. Game plan in place, the girls are off. -Are you talking about this trunk? How good are we at haggling? I'm reckoning not THAT good! Think a bit cheaper, Nicki. -Yeah, where would a woman be without a hairdryer? -Would you use this on your travels? -Never! Beautiful though, isn't it? You want to plug it in and see how it goes. Apparently, it works. It's been tested. is it worth having a haggle over this? Could be, couldn't it? Do we think the price is good? If we could get it for £20, it could be worth it. I like this. The Bakelite hairdryer is noted for consideration. Anything else? Natasha, how about these vases here, this pair of Art Nouveau vases? They are very Eastern European. so people breaking away from the more traditional 19th-century look. -Look at the beautiful design on these at the bottom. almost like plants growing off the stems at the bottom. there are some splashes of green paint on the body. and smudge it onto the body, so not ideal. £400 and then, at the back, £80. This dealer knows that they're not worth a huge amount. -What would you put an offer in at? -I mean, it's got to be half price. I don't work for less than 50%, come on! The vases join the hairdryer on Nicki and Natasha's wish list. Time to talk money with Richard. First, the Bakelite hairdryer. -What can we do on the price? -Um, what's it got on it? -Can I speak to them? -I hope it's a woman. You'll be fine. -Hey, Trisha, the vendor, is on the phone. Time for Nicki to try to haggle. What could be your best price? £27? How does that sound? £27. I'm very happy with that. Thank you. Bye. -Look at that! Well done! -First purchase! We have a hairdryer! We have a hairdryer. OK, relax. Whoo, whoo, whoo. Are we going to continue this theme? Next, the pair of Austrian Art Nouveau vases. They're currently on for £80. What's your best price on those? -The best I can do on them is £60. -Would you come down a bit more? -We were thinking sort of £40, £45. That means people haven't been picking them up. -He's ever so good, isn't he? I'm trying. -Thank you. We're willing to take a risk. -Could you dust them before you pack them up? Nicki and Natasha walk away with two lots for auction. and have taken the Morgan 20 minutes east to just outside Hereford. -Escape To The Country - good fun? so, yeah, it's an absolute joy, mate, it really is. But you've got a bit of a military background, haven't you? -I did spend about five minutes in the army. -Yeah, I went to Sandhurst, never won any medals. -But I grew up in an army town, you see, in Colchester. with a military history series. by taking Jules to the Herefordshire Light Infantry Museum. Ah, crikey! I've got to peel this off me, Phil. I'm not sure if Charles Morgan made a bigger car than this. They were small people in those days, that's for sure! and are meeting Colonel Andy Taylor to find out more. Jules, you'd better tell me if I've got to salute anything. I don't think there's any need to do that this morning. -Nice to see you. How are you? and the home of the Regimental Museum. You've packed this, haven't you? but then there's a lot of history to the regiment as well. the First World War and the Second World War. was one of the Allies' great disasters of World War I.
to control the sea route from Europe into Russia. a ally of Germany, out of the war. was in combat not long after. and that soon developed into stalemate. to try and break that stalemate. which the Herefordshire Regiment took part in. -as there was right the way through the battle. and told to advance to a dried-up river course. but took a lot of casualties through artillery fire. with around 50,000 Allied soldiers losing their lives. and the planning was not as detailed as it should have been. to plan well, to support the forces well. would, perhaps, not have been successful as they were. We've got here a collection of artefacts from Captain Ashton. Captain Ashton was the adjutant of the battalion at Suvla Bay. and he was also the last officer to be evacuated on 12th December. and later during the war as well. There are some extracts here which you might be interested in. "I had been first ashore. I was the last to leave. "weary, dirty, disillusioned. And, yet, I was sorry to go." either killed or wounded, and they had achieved next to nothing. heading for the pretty market town of Hay-on-Wye. -you must have worked with the Spice Girls. cos you're a lovely young 'un. apart from working with the Spice Girls? Give me some names. -Which was tremendous, really great times. that, for me, were true idols. -People like Annie Lennox and the late David Bowie. I looked after Prince, Eric Clapton, Phil Collins, Van Morrison. selling records but, today, it's all about BUYING collectibles. Next stop, Hay Antique Market, home to over 20 dealers. There'll be plenty here for this pair to pore over. I was going to say, "We need to find that one item." -We've found a mini bath. -In a way, is that quite cool? -Is that what it's called? So, they'd have taken it with them on their travels? Yeah, that's for travelling. It's for a quick rinse, isn't it? Of the delicate parts. How old is it? It's the late 19th century, 19th century idea. This one's probably 20th. You know, we're so lucky. We go to a hotel, we walk into a running shower. there's not necessarily going to be a bath for just you. -It might be a shared area. -It might be out the back. -you fill it up and you dip your hips. -You do. Or your maid does. Definitely a job for the hired help, methinks. The hip bath's a possibility. Bit rusty. Anything else? -That's fab on the wall! -Ha-ha, you love this, do you? -I think that's quite fab. Is it silk? Yes, it's raw silk, really nicely lined. Probably relined. You can see the stitching here. I think that someone's taken the time to reline it. -How much is the asking price? -We're creating a bit of role-play here, aren't we? Can you see an auction lot? One vintage silk kimono of abstract design, together with wooden fan. so time to call on dealer Jill to find out more about it. -You think as early as the '30s? -So, you've got £69 on the kimono. -And £5 on the fan. -How much would you be willing to let go of the two for? -What if we threw in the hip bath? -I could do that for £70. -No, it would have to be £120, I'm afraid. -I think a punt. Yeah. -Take a risk. Let's do it! -Jill, thank you very much indeed. and the kimono and wooden fan together for £50. the boys have motored to Ross-on-Wye. They've arrived at Elizabethan House Antiques. to decorative items, antique furniture and the rest. -Nice to see you. I'm Jules. Hi, Philip. How are you? Maggie, you've got a lot for us to explore here. Do you want to go that way and I'll go that way? -We should divide and conquer. -See you in a bit. Right, boys, you have £400 to spend. Let the hunt begin. Bellows. I know what Phil would do with those. That, if I'm not wrong, is an old door off a prison cell. What are the chances of finding something like that here? That's fabulous! And look at it. with all of its bolts and other metal fittings, is all there. That is fantastic. Let's feel the weight of it. Yeah, that was definitely from a prison. I might have to get Phil to help me with that. Phil, you're needed. It's an emergency. -Are you thinking what I'm thinking? -It's an old prison door, isn't it? -I'll tell you a little secret. -and sold it for about £200. -Yeah, but I was lucky. Good cop, bad cop, but I think I've just become the bad cop, haven't I? with its vendor, who's probably still inside. He said he could possibly do it for £60. We can tweak it to £55. How's that? I think if you said yes, I think he'd just jump at that. To be honest with you, I don't think £60 in itself is bad, actually. What ARE you doing? What are you doing, man? I'll phone you back in a minute, all right? -No, I tell you what, we'll think about it at £60. There's a couple of other things it's worth having a look at. -Hang to it for us for five minutes all right? I'm just going to go and beat him up in the corner! but Jules has a keen eye for unusual items. it says, "First World War officer's map torch." -I'm with the right bloke then. -I'd love to have a closer look at it. -Can you, Maggie? Could you open that for us? That's great. Look at that! I've never seen one of these before. OK, boss, talk me through it cos you're the militaria man. -There's "1917" written on it. -So, used in First World War trenches? -Is that not just a bit...? -Batteries, back in 1917, how big would they have been? Presumably, you unscrew that and they'd have gone in there somewhere. They've got 35 quid on it. that could be quite attractive to the right kind of collector. I don't think that's bad money really. I wish you wouldn't keep saying things like that. Stop it! Let's just rehearse this one more time. -The trouble is, it's the price, really. -Yes, it's the price, Phil. They normally do a lot cheaper than this, normally, don't they? Right, let's get serious, shall we? I think the very, very, very best on that one would be £28. So, my maths is really lousy. 28... So, we're talking 70 quid for the two, aren't we? -£70 for the two, isn't it? Nice try, Phil. It would actually be £88 total. Maggie? -That'll do. Maggie, you're a star. I'll carry THIS out. How are you going to manage the door? With great difficulty, I imagine. A successful bit of shopping gets the boys the prison door for £50. Wow! And the map torch for £25. Wow! And on that note, both teams bid farewell to the first day. -I feel this is the life from now on. -it needs to be in a classic car. -I've argued that for many years. -For all these years, they've got it wrong. stopping off at a few antiques shops on the way. -And a very attractive driver by your side. -I knew you were going to say it. -I just thought I'd help you. which means they still have £325 to spend today. leaving them with £198 to play with. to Ford bridge to meet their celebrity partners. Tell me what Nicki's like. Is she nice? -Is she really, really nice? -Is that a wee Spice Girls reference? -That's the one thing I've got in there. And what about Jules? Is it an old boys' club these days? and I enjoyed his company. I've still got some money left in my back pocket. I'm feeling confident today. Natasha and I are a good team. We've still got more buys to be had, I think. I should say so. Girls v boys - bring it on! I'd get out the way, if I was you. She hasn't found the brakes yet! -I have a problem with first, that's the truth. -Am I allowed to fraternise with the enemy? Oh, wait a minute, Nicki. They're going to set off. They're getting in the car first. -Boys, let me have a head start. -I won't be able to find first in this, either! -Look at the sound of THAT! -Oh, you rotters! You rotters! -Catch us if you can. -Let's see how I get on, shall we? Oh, look at them, cosying up. Arm behind the headrest. Look at them! They're buddies, aren't they? to start the day's buy. -They're going to be there too, aren't they? as to what we are thinking about. No, but they'll be at the make-up counter, you know, doing lippie. And we'll be amongst the boys' toys, no doubt. a bit of slap make-up, you know. but today's going to be equally exciting. And we don't have much to buy now. Looks like the boys are first to arrive. Stand by. Whoa, lovely! Thank you, mate. Did they get here before us? -Oh, they did! Oh, no! -Here they come! Ha-ha, come on, Phil! There'll be blood everywhere if you don't let us in! -This is like the Brownies and Scouts. You're terrible. You can have first dibs, go on. Off you go. so no need for squabbling, eh. -We need to find something completely weird. Look how beautiful everything is. We need to find something weird that has the edge. -Ah-ha! It smells a bit fishy. -I think it is a mask, look. Ooh, imagine the smell inside! Guys, I've got someone here who'd like to meet you. -I can smell something fishy! But isn't it brilliant? Go on, just for me, Phil. Just for me, go on. Give me your glasses. That's it. -I've got my bloody ears stuck! -You'll just have to wear it all day. -Shall we just leave them? -OK, nice to see you. Bye, come on. -It's nearly £300 that. Be careful. It's going to hurt you more than me. Argh. Well, if you will play silly beggars! Nicki's spied something she likes. -I love this. Can I put it on? -I'd be saying, "How chic." -It's so '70s, isn't it? -It's so smart. Now, it says silver. so is it the London look? It's 1972. That is smart. What do you think? We've not been everywhere. -and then go and visit Ben at the counter? Ah, yeah. Now, how are the boys getting on? Nice, actually. Yeah. Fairly sturdy, aren't they? -How much is the price then? -It's at the other end. Let's not trash the rest of it. There we are, mate. Is it...? Ooh. Well, you see, in auction, they're going to make 100 to 150, I think. -Yeah, but I like them. Do you like them? -I do like them, actually. I'll be honest, I would happily put those in my own house, actually. -Yeah. If we could get those for the right money. They've got to be 80 to 100 quid, really. That's quite a big drop though, from 225. Do you think they'd do that? Don't know. Depends what they bought them for. on the other side of the shop, Nicki's on a roll. Yes, it's wee tiny samples. So, these are for collectors of specimens. -You could use it now for jewellery. You could use of for a million different things. Yeah, and look at that price. Do you know what I would expect? -A "1" in front of that. That's in at 65. Well, at auction, I think it's a good 40 to 60. -So that has potential for us. -For sure, that has potential. Another possibility. Anything else, girls? -Yeah, I like that, actually. Totally trendy, hat stands, for some reason. so what a cool way to hang up all your coats and hats and everything. You could see that in a restaurant, couldn't you? -Yeah, I wouldn't want to be spending £85 on that. -As lovely as it is. a rather nice enamelled sign. As you do. or a little chichi London coffee shop, maybe. -Actually, it's not too battered, is it? Not at all and, in fact, it's still got the enamel on the back. So, that's 235. These are 225. That's 460 quid. -That's more than we started with! -Yeah. Not boding well. OK.
because we're looking to drop quite a bit on both of these, aren't we? What I'm going to ask you to do is sit in the chair, say nothing. Meanwhile, Nicki and Natasha have located dealer Ben to talk money. -Where does £100 sound for the two? Well, it is a bit high cos I've still got my eye on something else. -And then £100 for the two upstairs? -It's a bit scary for me. I don't like three figures. -To get down to the two figures, we'll go £99. We're taking two pieces and then this for £40. -Is it a deal? Thank you so much! -I think we should all shake hands. for £95 and a modernist silver cuff for £40. Phil's gearing up to do a deal with Andrew on the benches and the sign. The combined ticket price is £460. And we also like the coffee sign. I'm really glad you're sitting down. It's down to what you've bought them for, isn't it? -At the end of the day, yes. -You can either do a deal or you can't. I think it's a bit TOO friendly, actually. OK, what could you do then? -180, you wanted them for? -Yeah, that's the benches and the sign. I'll get close. I'll do 200. But there's no, "I'll go and have a think about it." No, we'll make our mind up now and give you 190 quid for the three. -£195 - you're a gentleman, thank you very much. the benches for £95 and the enamelled sign for £100. and have headed to Kington. you're more likely to think of Holland than Herefordshire. resides the sole remaining hand carver of clogs in England. right here, in the UK. Lovely to meet you, Jeremy. you don't necessarily think of clogs, do you? but that's obviously not the case. No, they were probably worn just as much in Britain, actually. When I think of a clog, I think of the wooden touristy affair. -Is that a purist definition? The British version was always a mixture of leather and wood. what type of person would have been wearing a shoe like that? Wales, Scotland, Lake District. It seemed to be very regional. -A lot of it comes down to soil type. they don't clog up cos the peaty soil's too light to clog up. and they just get higher and higher and then you have to kick them off. -Ah, so that's where the phrase comes from, "clogging up"? how would the cost have compared, say, a clog to a boot? -and a clog was a day and a half. That's a lot of difference, isn't it? took shape during the Industrial Revolution. began back in the 1880s. -It petered out in the '50s. -Did it? It went to the 1950s? -you didn't need coupons for them. How long would it take to create a clog just like this? About eight to ten hours for something as simple as this. what it takes to carve a clog from scratch. -..be able to cleave it out. That's incredible. You really can see it taking shape. So, that's fairly broad pattern. It's been blocked out. Jeremy, thank you so much. It's fascinating, the whole process. and let's hope these skills continue for future generations. Can you imagine just walking past here? Look at him. What an artisan. -Tour de force. The Clog Man. and made their way to Burford in Oxfordshire. this beautiful old town is home to the chaps' final stop. -This is nice, Phil! Look at that! A country house thrown in. Now, I might need a team of surgeons to help me get out of this thing. Come on, mate, come on. -Last visit. There you are, sir. Unhand him. Just as well it's your last shop then. -Jules. Very nice to see you. -and we'd like to buy one or two items? -Yeah. See how we get on. But from this moment on, I'm not going to say another word. So the dealing's left to me. -The dealing's left to me then. I'll do my best to take all your money, Jules. Phil, trust me, it's going to be all right. Right, you've got £130 left to spend. Off you pop. Look at that! I have always fancied one of those. A genuine safe. Ooh, mind you... Bit more money than we've probably got. -You've got a good eye. T Withers & Sons of West Bromwich. -West Bromwich, don't you know. so there's your challenge there. You've got no chance of matching me, not a chance. All right, I'm just laying down the law here. You can stop talking now. You can absolutely, you can absolutely stop talking now, mate. Serrell silenced? Well, there's a first! on the late 19th-century safe? Stand by. -somewhere round the sort of 40 to 50 quid mark. Yeah, I've dived straight in with a pretty tough offer. -Ooph! Um...do you know what? We're not a million miles away. That's one of those items that I bought at the right money. What about if I met you somewhere close to where you want to be? £65. What if we split the difference at 55? 60 and you've got a deal. 60 quid on the safe, Phil, yeah? Done, sir. Lovely. if I've finally got my sums right - with £70. -I do need to turn some sort of profit on this? -Yeah, I've got something in mind, actually. -Come on then, show me. -What about something like this lamp, Jules? -And you've sort of burnished it up and mounted a lamp on it. -He's got no chance of buying that for that money. Yes, it's been properly done and tested. -No way is he buying that for £70. Not a chance. -I'll let it go for £70. -The safe and that for £130? -Yeah, that's your budget done. You may speak now, if you wish, sir. I think, actually, he's genuinely lost for words. Trust me, that never happens! secures the boys' final two lots for auction. Hurrah! With both teams all spent, time for a spot of show and tell. -I wonder what one of the things are that they've bought. Go on then, you reveal first. -Is that a prisoner door? -That is a prison door. And last but not least, how about this? -Is that a spraying machine? It's a garden sprayer, converted into a table lamp. -Is this yours as well? -How much have you spent? -Can I just say, you're so predictable. Boys v girls and how macho have you gone? How macho? "We've spent every penny. We bought a prison door." -It's all about the size in that corner. -It's all about the size. -What does that tell us? I won't go there. Enough of the boys' bulky buys, girls, it's your turn. -Ooh, very elegant. Look at the fan! -Jules, how's your hair? You want to borrow our hairdryer? -Have you tried that out? -It works. So, we have our stand here. It would make a great jewellery box, wouldn't it? -How much for the kimono? -£50. There we are. Cheap outfit. -I love the bath though. -we should get out of here, Nicki. Think about what you've done, you two. Bad jokes aside, what do they really make of each other's lots? -but they have bought girly stuff, haven't they? -It wouldn't be for me. I'm not too sure about Dame Edna's dressing gown. I looked at theirs and I loved the lamp, that unusual lamp. -It's so cool, so Philip. And those benches, but I wouldn't have picked those. -I'm happy with everything, Natasha. I'm really pleased with them. and I thought, "We're proud of this." -I think we've done well. in North Finchley in London. Jules, how many auctions have you been to in your lifetime? -I've gone to quite a few actually. Once you get the bug, it's hard to let go. You have the old right hand syndrome, do you? -I tend to sit on them if I can. Remember, no bidding for YOU today. You're selling, sir. and are waiting for the celebrity partners. -Out of the wind and the rain to Profitland. You've mastered getting out of that thing! -We are so looking forward to this. Get in. Come on, it's started. Let's remind ourselves of the purchases. Nicki and Natasha spent £337 on six lots. spending each and every penny of their £400 budget. and the man with the gavel is David Palmer. What does he make of our teams' lots? The selection today is surprisingly good, I think. They're proper things that they've found. The last item is the one that I'd buy, the lamp base. That's good. and have in the house. is that kimono. Why? Why did they buy it? You were there. Why did they do it? Fingers and toes are crossed the buyers will love it. Our teams have taken their seats. Who will be victorious, the girls or the boys? The girls are up first with their vintage Bakelite hairdryer. Fully tried and tested. So which one of you tried and tested it then? It works, I promise you it works. And it gets very hot. It comes with a provenance. There's a gentleman I know is very keen at the back. -Thank you, sir. I will sit down now. -She's just shown it to a bald bloke! -I think I'd better give up! -Right, there we are then. You've seen it, handled by the lady there. 20 quid. 10. So cheap. At 10, I sell here at 10. Take a 2 now. I'll throw the lady in blue in with it as well. -It's a deal! You'll get a kiss. Can someone lend me some money, please? -You can have a kiss too. 22. The bid is over here at 22. -I'm selling then at £22. the hairdryer makes a loss. -Get that smile off your face! It's a little soon to be so smug, Jules. Look out, here comes your 19th-century prison door. £20 for it then. 20 I'm bid. And 2? 22. 25. 28. Over here at 28. 30. 5. 40. 40. Madam, 45? At 40. It's with the gentleman at £40. It's got to be 50 quid at least, surely! -Well, it was when WE bought it. -I will sell back there at £40. It's a tough crowd today. That's a loss apiece. -can we all just be in it together from now on? Let's see if Nicki's Austrian Art Nouveau vases fare a bit better. Start at 20. Anyone, 20? Oh, dear. Not the result they were hoping for. I would have taken everything we bought home with me. Unfortunately, you can't buy your own lot. as your World War I officer's map torch is up next. -Come on, take home a bit of history! -20 here. 22 behind you. 25, madam? 25. 28? 28. 30. Now go 30. At 28. With him at 28. I sell with him at £28. He's not a relative of yours, is he? -At 28, I'm selling now. -We're not lucky charms, are we, today? First profit of the day though, albeit a small one. something that's really fascinating and genuinely unusual. Jules' find is next to go. His big enamelled sign. The net's bid 20. Take a 2 in the room. Goes at 20. -22. 30 on the net. -It's all over the place. -45. 50, madam? 50 to the lady. -Sold to the lady here at £50. -Oh! Cheap at half the price. -It WAS half the price! London does not love our teams today. Bad luck. My glass is always half full. the vintage kimono and wooden fan. -Show us what you're made of, girl. -Look at this! Bit of glamour in the room. Lady's raw silk Japanese kimono showing now. And the fan. -Nicki is rocking the kimono. There's the kimono, OK, being nicely modelled. There must be a price for me just modelling it, mustn't there? You get the hanger as well. 10 I'm bid over there. At 10. Take 2. Goes then at 10. -With the fan, with the fan! 15 on the net. The net at 15. 18. 20 in the room. I'll take you at 20. 22? 22 at the back. 25 now? 25. It's been worn by a famous person! Net, are you in at 35? 35. It must be worth at least 40 for that. Come on, get back over here. -I think she's been sold with it! Hey, I hope that Nicki would be worth more than THAT! We got you a booking for Widow Twankey. Hey, I could see YOU playing that role, Philip. Here we go again. It's the turn of the boys' benches. 100 I'm bid. 100. Take 10 now. 150. The phone then at 150 now. I'm selling on the phone at 150. -Net, nothing on you. At £150. Nicki and Natasha need a profit here. with vintage brass coat stand next. Anyone, 20? 20 here. With the lady at 20 now. I'll take a 2. 22. 40 with the lady. The lady now at 40. -Finished and done at £40. Someone's walking away with a bargain. But another loss for the girls. -We've learnt a lot today. The boys' late 19th-century safe is up next. -Let's say 50 for it. Anyone, 50 quid? The top's warm. We've got a lady sitting on it! -He's really trying for us. I love him! 10. 10 here. At 10 now. -I sell then, on the maiden bid, at £10. -Selling then at a tenner. Lordy, it's a buyer's market today! We bought the right stuff. We're selling it on the wrong day. Surely the girls' modernist silver cuff will pull in a profit. Come in at 10 for it. £10. A very decorative piece. Anyone, 10? We haven't got a bidder. Fiver then? You'll go 10. At 10 here. The bid is here at 12. The lady at 12 now. At 15. Over there at 15. -Am I allowed to sulk at this point? -We could have a team cry. 18. Back down here at 18. 20. -Come on, it's gorgeous, it's gorgeous! I sell to the lady, here in the middle, at £22. -is that one of the things you'd have taken home with you? Nothing but losses for Nicki and Natasha. Ouch! We go to Herefordshire, where you think you'd pick up a bargain. -it's been the exact opposite. Can our girls finish up on a profit, I wonder? It's their early 20th-century metal hip bath. £20 for it. Come in at 20. Anyone, 20? 20 quid over here. At 20 now. -At the back at 40. -At 40. I sell then at 40.
but it's still all right. Oh, dear. Well, you can't win them all. Or ANY of them, it would seem, girls. -Whatever it went for, it's still a lovely thing. -It IS a lovely thing. the Edwardian spraying machine, converted into a lamp. 30 I'm bid. With the lady at £30. -Come on, fight over it. 35 on the net. Now 40. 40 in the room. The room at 40. 45. The net at 45. Put it up to 50. At 45. Sell on the internet then at £45. Nobody else? 50. With the lady at 50 now. -The room has it at 50. -Where did you get that one from? -It's crawling its way up! I'll take it. It's an upward bid. 53. -Don't be outbid by a mere pound. -I sell at 53 then. They've gone 54! At 54. -At 55, I sell then. -Here in the room at £55. Not THAT good! It's still a loss. Sorry, chaps. -Shall we slink out through the door? -I'm going to hold my head down in shame. It was a tough room, Nicki. the girls made a loss of £190.22, after paying auction costs. Which means they end their Road Trip with £209.78. losing £126.94, after auction costs. they're today's winners - got it? - finishing with £273.06. And, just like that, the journey has come to an end. Gosh, I thought they deserved better, didn't you? -You two have been such good fun. -We have loved it! Thank you. -Phil, you taught me a lot, mate. We have absolutely loved it and I think we've learnt a lot as well. -You learned how to lose money! -Right, it's going to start to rain. -You're still my antique panther. Come on, Nicki. If I can find the gear, I'll buy you lunch. -What an amazing few days it's been. -It hasn't been long enough for me. learning from the master. Gosh, he drives a hard bargain. without him whispering in my ear. Well, the antique panther herself, Natasha, did a splendid job with me. But, rest assured, I've now got a real taste for it. but I've come out with a smile on my face. Now, that's what we like to hear. What a trooper! Fare thee well, Road Trippers. Top presenting pals Nicki Chapman and Jules Hudson escape to the country to find antiques with Natasha Raskin and Philip Serrell. It becomes girls versus boys, both teams with £400 in their pockets. Kicking off from Wormsley in Herefordshire, they Road Trip into Wales and Oxfordshire, before finishing in North Finchley, London for an auction. Along the way the girls meet a clog maker who carves shoes by hand, while the boys head to the Herefordshire Light Infantry Museum to hear about the regiment's involvement at Gallipoli.